The love for silk sarees will never fade away. We all love to wear and own many silk sarees in our wardrobe. Silk sarees gives you an additional grace look to your wardrobe that you will thank yourself for owning it. One silk saree is equal to ten western outfits, a single silk saree will carry all the grace, elegance, culture, modernity and tradition together. There are many flavors and variations in silk sarees. 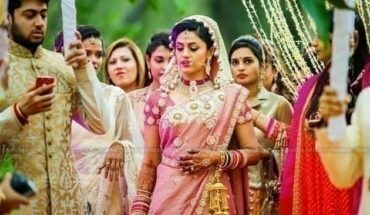 In this article, I have clubbed together some of the different types of silk sarees available in India. Get explore to the unknown types of silk saree available in the market. Banarasi sarees are originated from Varanasi which is considered to be one of the finest sarees in India. They are well known for opulent embroidery, gold and silver zari, and fine silk. This banarasi sarees are made of fine woven silk which is decorated with intricate designs this gives the saree relatively a heavy look. 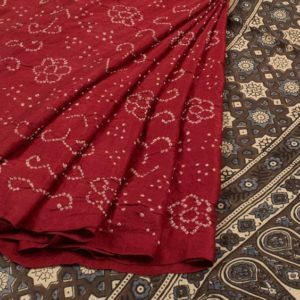 Banarasi silk sarees are special in Mughal inspired intricate designs like foliate and floral motifs, bel, kalga, jhallar designs in the border edge is the main characteristic of this sarees. There are four different varieties of banarasi saree namely silk, organzo with silk and zari, Shattir and, Georgette. Based on the design pattern, they are divided into other categories like Tanchoi, cutwork, Butidar, Jangla, Tissue, and Vaskat. Depending on the intricacy of the patterns and designs, a saree can take 15 days to one month or even more than 6 months to complete. Banarasi sarees are most commonly preferred by Indian women’s on special occasions like wedding, festive times. Kanjeevaram also was known as Kanchipuram silk is a type of silk saree originated in Kanchipuram, Tamil Nadu. These sarees are most commonly worn by bridal and special occasion sarees by most of the south Indian women. Kanjeevaram silk sarees are woven from pure mulberry silk threads. This pure mulberry silk comes from South India and the zari used in the saree comes from Gujarat. 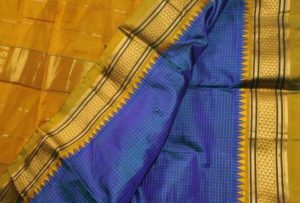 One interesting part of Kanjeevaram silk saree is that the Sari, border, and body of the saree are woven separately and then interlocked together. The joint is woven so strong that the border will not detach even if the saree tears. This makes Kanjeevaram silk sarees to stand unique from others. 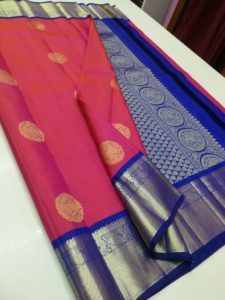 They are different types of Kanchipuram silk sarees which are distinguished by wide contrast borders like checks, temple borders, stripes, buttas and many more. Most of the designs and patterns found in Kanchipuram sarees are inspired by the scriptures and images of south Indian temples. Tussar silk saree is made of larvae of several species of silkworms from the moth genus Antheraea. These silkworms are collected from the trees of wild forests such as Shorea robusta and Terminalia. Tussar silk sarees are valued for its natural deep gold color and rich texture. There are produced in different countries like India, Sri Lanka, China, and Japan. The Sari used in Tussar silk saree is considered to be the most important Tussar silk product as it is used as the base material for furnishing fabrics, handicrafts, and stitched apparel. With the introduction of different chemical dyes, there are different ranges of colors available. Art silk also known as artificial silk sarees is a synthetic fiber which resembles like silk but costs less to produce. Artificial silk is equivalent to rayon. When it is made out of bamboo viscose it is called as bamboo silk saree. Though art silk sarees looks similar, original silk sarees has unique features that distinguish it from artificial silk sarees. There are various test methods to find out the difference between original and art silk sarees. Tests include like rubbing the pile in hand, dissolving the pile in a chemical test and many more. Bhagalpuri silk saree is a type of Tussar silk sarees which indicates Bhagalpur, Bihar where the saree is produced. 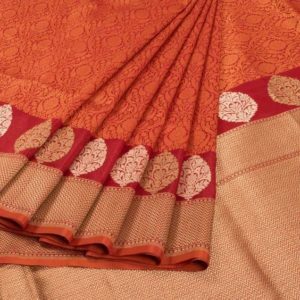 These woven materials are used for making sarees which are named as Bhagalpuri Sari which is known as silk city of India. Bhagalpur has numerous mulberry orchards to cultivate and grow tussar silk. Nathnagar is the place where Bhagalpuri silk is processed in huge. Other than saree, Kurta suit is also made from this Bhagalpuri silks. Baluchar saree is a type of silk saree in India, most commonly worn by women across Bangladesh and India. The origin place of this saree is Bengal which is well known for its depictions of mythological of Ramayana and Mahabharata in its edge border. This sarees are mostly common preferred and owned by the upper class and Zamindar wives in Bengal at festivals and wedding. As Baluchari silk sarees resembles an elegant and royal look which showcase the status of the people. 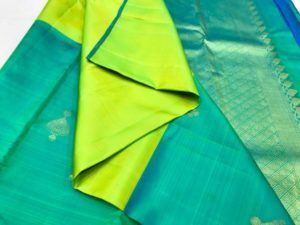 Konrad silk saree is also one of the different types of silk saree originated in TamilNadu which has gained its focus due to the usage of high-quality fabrics and traditional affluence is woven in it. Konrad silk sarees is also called as Munnhagam saree and Temple saree. 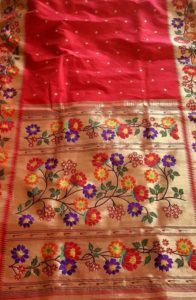 A hand weaved Konrad saree cost higher and it will well known for its border which is exclusively designed with the natural impact of natural motifs and animals embedded to give a royal look. Konrad silk sarees are designed in different color variations which is unique from other silk sarees. Mulberry silk is produced largely in the Karnataka which produces nearly 45% of the total mulberry silk. Mysore silk sarees are a patent product of KSIC. The sarees are woven in high quality which carries its own inheritor of royal legacy with pure silk and gold zari. Mysore silk saree is a cultural resemble of both south and north India. Chanderi sarees are originated in Chanderi, Madhya Pradesh. This style of silk sarees contributes two cultural regions of the state Malwa and Bundelkhand. Chanderi sarees are available in three kinds of fabric such as silk cotton, pure silk, and Chanderi cotton. Peacocks, traditional coins, geometric designs, floral art are woven into different Chanderi patterns of the sarees. Chanderi sarees are well known for its silver and gold zari borders, opulent embroidery, and fine silk. Thanchoi silk sarees is a type of silk saree which is characterized by its floral motifs. The weaving style followed in Thanchoi silk saree is equal Banarasi sarees. Basically, these sarees do not have borders but the pallu and borders are distinct from each other. Thanchoi sarees are woven with the intention to give a raised effect like brocade. Paithani silk saree is considered to be one of the royal sarees among all the silk sarees. This has a higher treasure in the trousseau of Maharashtrian brides. Paithani sarees are considered to be a Queen of silks as it gives aristocrats and royal touch when it is worn. The commonly used motifs are the peacock, lotus, vines and flowers, parrot, almond. One best thing about Paithani sarees is that both the sides of the saree look same even the pallu and border of the saree are same on both. These sarees are available in different colors like red, yellow, sky blue, peach pink, magenta and many more. Most of Paithani sarees are available in two shades, one reflects on the saree and the other on the pallu and border. Bandhani silk sarees are one of the different types of silk sarees in India, originated in Gujarat. 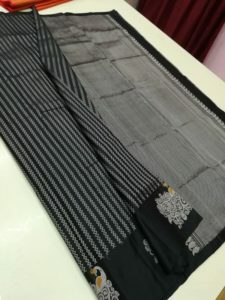 The weaving techniques used in Bandhani silk saree is something special and different from other styles. Jaipur produces a large number of Bandhani silk sarees. Raw silk sarees are commonly known as Paat in the Eastern part of India which is a most natural form of delicate and raw fiber which can be molded into different garments and fabric. There are different kinds of silks which can be ranged based on the quality and fiber of the garments. Raw silk sarees can be complemented with heavy plated gold plated, diamond jewellery for a wedding day. Cotton silk sarees is also known as Handloom sarees which is a hybrid of cotton and silk yarns. The texture of the saree varies based on the type of yarn used in the production. Cotton silk saree is light weighted, soft and absorbent in nature which suits perfectly for summer. These are some of the various types of silk sarees available in India. You can try it out any of this different style of silk saree for your special occasions and stand unique in the crowd.